If you are going to buy the best kit for the water, it makes sense to buy the best rack for transporting it from place to place. A top-quality kayak is expensive and highly valued. Therefore, you probably don’t want to toss your boat in the bed of your pickup truck and just hope it stays in place. Fortunately, designers have come up with a solution for every type of vehicle – so, no matter what the depth or type of bed area, you will find a rack that works. Yet, the amount of choice makes the selection of the perfect kayak rack for your truck tricky. There is a wide variety of shapes and sizes to choose from. 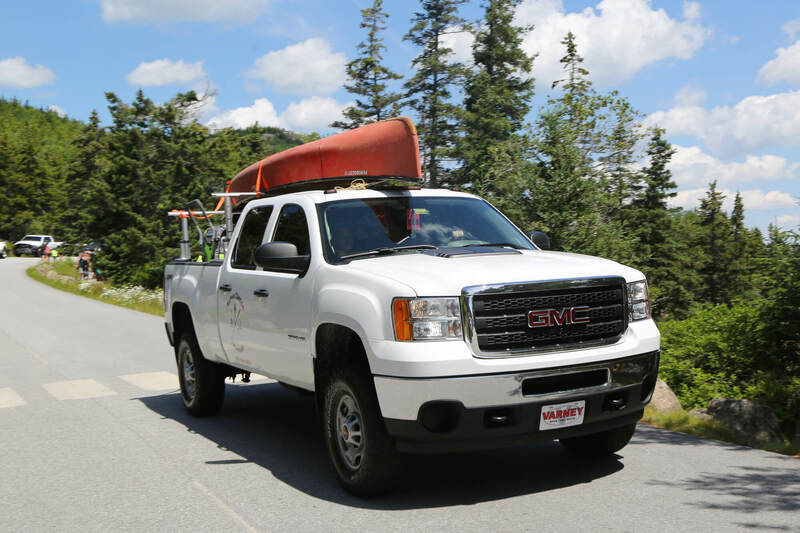 Here are the best solutions for hauling your kayak on your pickup truck – with all the important information to consider to help you make your choice. Here is a fact that shouldn’t surprise you – the bed of your truck is shorter than your kayak. You could tip the kayak into the bed space – have one end sticking up in the air and bungee it to your truck. You can hope that works, or you can extend the space at the rear of the truck, using horizontal bed extenders. In short, it is a fixture that sticks out the back of the bed and is completely stable, as it hooks into the hitch of the truck. The great news about most bed extenders is that the amount of space offered can be set to the exact length of your kayak. This makes the horizontal bed extender a perfect option for longer kayaks. Also, as the boat is sitting in the bed of the truck, so it is great for heavier vessels that would cause wind resistance and noise if held above the roof of the cabin. There are two safety points worth noting with horizontal bed extenders. First, be careful when parking. You have made your truck longer – sometimes significantly. Reversing into tight spaces could cause damage to your prized kayak. Second, tie a flag to the end of the kayak, to warn drivers that there is an object extending beyond the vehicle. 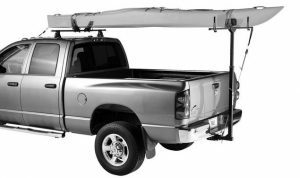 These two safety points aside, the horizontal bed extender is one of the most stable kayak carriers for trucks. 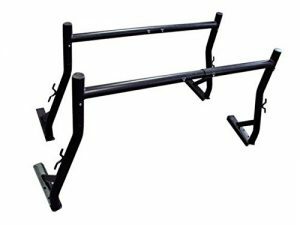 The Lund bed extender is the best kayak rack for trucks in this category. 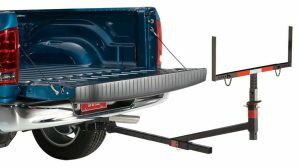 The Lund Hitch Rack Truck Bed Extender will give you an additional 7 inches clearance from the floor and is equipped with side wings that are adjustable from 27 to 49 inches. 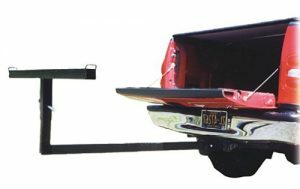 The rack can extend to 56” beyond the hitch and carry an even load of 750 pounds. This is more than enough for most kayaks you would hope to transport – probably two. The Lund bed extender comes highly recommended by users and makers have included some thoughtful additions. First, they provide flags and reflective tape for safe hauling. Second, the bed extender can turn into a portable sawhorse for those working in a trade. This is great for those using the extender for lumber rather than a kayak! The Darby Industries 944 Extend-A-Truck is also an excellent way to extend the bed of your pickup truck. The best feature of the Darby is that is can be stored flat behind your truck seat when not in use. It is also adjustable and can be used for roof top hauling. The extend-a-truck is designed for secure and safe hauling of long loads and comes packed with a red flag to keep other drivers safe. can be stored flat when not in use. Issues with parking and the idea of driving with a length of boat extending out beyond the vehicle can make people uneasy about horizontal bar extenders. It can make driving more difficult and some feel the kayak is vulnerable. The vertical bed extenders secure to the truck in the same way as the horizontal bed extenders. However, the kayak is lifted above the roof, attached to a bar that sits across the cab. A stabilizer bar is then fixed at the back of the truck. This bar is braced at all four corners of the back of the truck – making it completely stable. The kayak’s weight is then distributed evenly between this vertical extender and the cab roof. The downside? It can create some additional wind resistance and noise. However, some feel that the kayak looks altogether more secure on the back on the truck. Thule are a leading brand in roof racks and cargo boxes. They have certainly done enough to get the top recommendation in this category of kayak carriers for trucks. One of the great things about this vertical bed extender is the name. The idea of goal posts gives an excellent idea of the shape of the stabilising bar that sits at the back of the truck. This kayak carrier is designed specifically with water sport equipment in mind, so has hitch receivers that can haul canoes, kayaks, paddleboards and more. If you are worried about potential dinks and dents in your cab roof, there is no need. There are two solid load straps that keeps the kayak from bouncing around as you drive. The plastic coating on the bars also protects the kayak from damage too. A great alternative vertical bed extender is the Help U Load Heavy Duty Truck Bed – which can also handily be adapted to be a horizontal bed extender too. This is a heavy-duty option, as its primary market are those wishing to haul building supplies and lumber. However, it also offers a perfect solution for carrying your kayak too. It fits to your truck with 2-inch receiver hitch and can therefore be attached and ready to use in minutes. 5 heavy duty straps for securing your kayak, meaning no bounce! snap pins that make this super-easy to install. Bed extenders are temporary and should be fixed when needed and then stored flat pack when not. A utility rack is different. This is a more permanent solution that is bolted into the truck bed. Both types of bed extenders only allow for 2 kayaks to be carried at a time. A utility rack is a much more practical option if you need to carry more boats than this at a time. It is a durable system and will take a lot more use than the bed extenders. This makes the utility rack the perfect option for those who kayak all the time and don’t mind the added weight permanently attached to a truck. The utility rack gives you that added element of versatility. You can load more and even turn your pickup truck into a makeshift campsite with the use of a tarpaulin. Even if you are semi-serious about living the outdoor life, a utility rack might be the better option for you. The number one utility rack is the TMS Utility Ladder Rack. This is a set of two heavy duty steel bars that are design to haul longer items, such as a ladder – but also your kayak. It is designed specifically for the multifunctional use of work on a construction site and play on the water. As the name suggests, it is built to carry an even load of 800lbs – more than enough for a number of kayaks. It is fully adjustable between 5 and 7 feet – so can be used in a variety of trucks. A great alternative to the TMS model is AA-Racks X35. 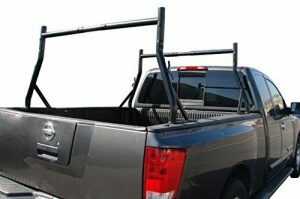 This too comes with two heavy duty bars that carry up to 800lbs and fixes easily to the back of your truck. There is a greater chance of compatibility with most models of truck, due to the drill holes placed to work with most hitch connecters but beware – you will be expected to drill these holes yourself before fitting. There are none drilling options, but then you lose this flexibility. It is also extendible, should you have a wide truck. Another great feature is the rope hook on the side of each upright – giving you the option to tie tools to the bars. Its worth noting that this product will not fit to your truck if you have the following: tool boxes, bed covers and camper shells; an inner bed smaller than 51 inches or a pre-installed inner track. feels like your kayak is solidly secured to your truck. how often will you use the rack? do you need to carry more than two kayaks at a time? do you need the rack to function for work as well as play? is the rack easy enough to install? does the truck stay easy to drive and with wind resistance and noise kept to a minimum? is the rack compatible to your truck? The answer to these questions will dictate the carrier you select. It is likely that if you are a kayak hobbyist then the horizontal and vertical bed extenders will be enough to do the job. It also gives you the option to restore the look of your pickup truck when not hauling your boats. However, if you are out in all weathers and enjoy the camping life on top – then the more permanent solution of the utility rack offers you a lot more flexibility and versatility.